Part of The NSG Group, Pilkington United Kingdom Limited is one of the leading glass suppliers in the UK. The NSG Group as a whole has a vision of making a difference to the world through the manufacture of innovative glass technology with glass and glazing products for the building trade, the automotive industry and the specialty glass sector. Pilkington United Kingdom Limited based in St Helens – ‘The Home of Glass Innovation’ – has both offices and manufacturing plants across St Helens , which include: Alexandra Park, Greengate, Watson Street and Cowley Hill. Cowley Hill, the newest development, provides a purpose built factory that complements its existing operations and portfolio of glass products. The site’s £36 million coater enables the production of ultra-thin special coatings to be applied to glazing solutions, allowing for an extensive range of high performance energy-saving glazing products to be produced. 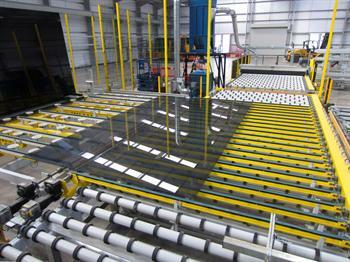 A British first, this jumbo off-line coating plant, built to manufacture high performance products such as the new Pilkington K Glass™ S range, as well as the latest additions to the Pilkington Suncool™ and Pilkington Optitherm™ ranges, allows for a wider range of glazing solutions to be manufactured in the UK. Incorporating the latest technology from the world’s leading coater manufacturer, the coater has enabled an increase in the capacity and capability levels, helping the UK meet the demand for energy-efficient glazing – producing an excess of 10 million sq metres of glass per year. The Pilkington brand which originated in St Helens over 200 years ago, is recognised for its rich portfolio of glass products that provide homeowners, architects and specifiers with a wide range of benefits such as: Solar Control and Thermal Insulation, Fire Protection and Self-Cleaning. For more information about the Pilkington glass please visit the official website.